David Bowie, the singer, actor and fashion icon, has died aged 69 after a battle with cancer. Campaign rounds up five of his memorable ads. Bowie’s son, the film director Duncan Jones, confirmed the news on Twitter this morning. Jones said his father had died peacefully after an 18-month battle with cancer. Undoubtedly one of the UK's most recognisable and influential musicians, Bowie rose to fame in the 60s with the launch of his second album, Space Oddity, which featured the hit single Major Tom. He created the alter-ego Ziggy Stardust and had international success with the albums The Man Who Sold the World, Hunky Dory, and then the post-Ziggy album, Aladdin Sane, and Let's Dance in 1983. He also built up an enviable record as a movie actor, having starred in The Man Who Fell to Earth (1976), Just a Gigolo (1978), Labyrinth (1986), Zoolander (2001), The Prestige (2006). Bowie’s star power was often harnessed in marketing campaigns, as he appeared in ads spanning four decades for brands including Pepsi, Vittel and Louis Vuitton. A fresh-faced Bowie promotes ice cream on a stick, in an ad directed by an up-and-coming director called Ridley Scott. Bowie sings alongside Tina Turner to promote the sugary soft drink. Bowie parodies the 1976 movie in which he starred, The Man Who Fell to Earth, by falling from the sky and crashing through the roof of a motel. He gets up and says, "I’ll never get used to that". Nestlé Waters’ Vittel brand produced an ad to come out at the same time as Bowie’s 2003 album Reality. Bowie walks through a house to the soundtrack of the song Never Get Old and interacts with different versions of his alter-ego, Ziggy Stardust. 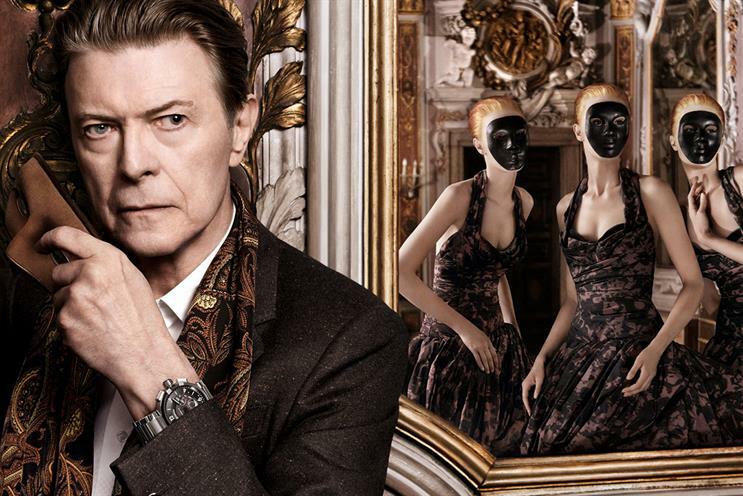 The ad, to promote LV’s Tambour watch and Vivienne bag, stars Bowie alongside Arizona Muse, showing the journey of the Vuitton woman.